Here we share top space saving beds including ideas for creating additional storage, multiple use spaces & maximizing room capacity. The bed is an integral part of the home. It where you catch a good night’s sleep after a long tiring day from work and where you can finally enjoy some rest and relaxation. 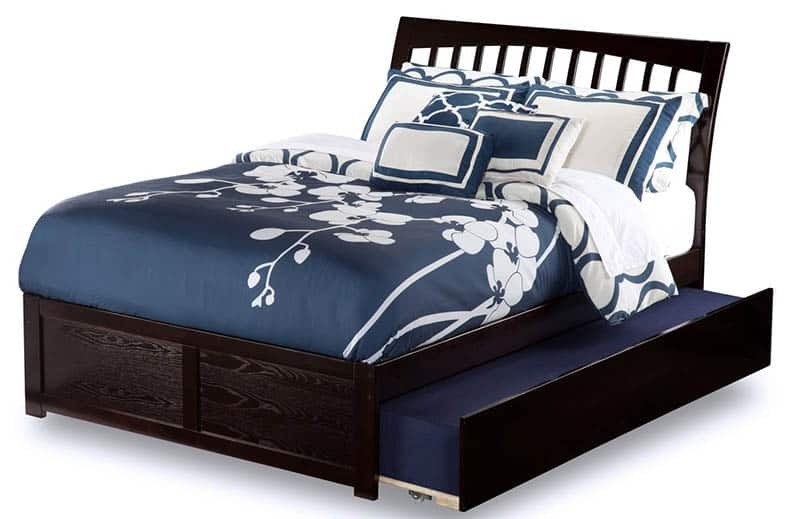 However, the bed is also one of the most bulky furniture pieces in the home. It takes up a lot of room and is crucial in terms of layout. And nowadays, not everyone has the luxury of space. With the continuous rise of compact spaces and smart design solutions, the need for compact and space saving furniture is a constant. Over the years, bed designs have evolved and innovated. From simple flat surfaces for sleeping, beds now serve multi purposes in the home. Designers and manufacturers offer beds with convenient and intelligent storage solutions that help keep your small rooms airy, more spacious and well-organized. In addition, new bed designs also feature more compact sizes which provide maximum functionality, without having to sacrifice aesthetics and design. 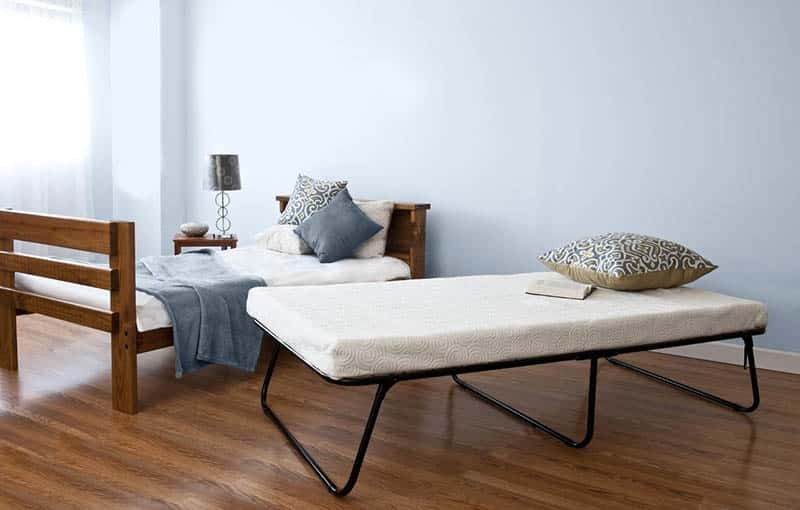 Below we give you our very own guide on the different types of space saving beds and how they can help you maximize every inch of your home. Full size beds are large furniture pieces that take up majority of a bedroom space. Space saving beds are more clever, compact versions of regular full size beds, which help improve the functionality of a space, without occupying much room. Typically, space saving beds incorporate special mechanisms which allow them to transform from one furniture into another. With the intent to reach a space’s fullest potential, space saving beds typically incorporate storage units such as shelves and drawers to help reduce the need for separate furniture items. Space saving beds are ideal in tight quarters, small rooms, apartments and studios. Here is a look on the most popular types of space saving beds, along with their positive and negative features. For more ideas visit our gallery of different types of beds. Created by William Lawrence Murphy during the early 1900’s, Murphy beds have long been known to be one of the most efficient space saving beds up to this day. Also known as a wall bed, pull down bed or fold down bed, a Murphy bed is a type of bed that is hinged at one end, enabling it to be folded up and stored vertically against a wall or in a closet. William Murphy’s innovation originally made use of old closet door jamb and some door hinges, that allowed him to build a pivot that attached the bed to a wall and allowed it to fold down as needed and fold up for easy storage whenever it is not in use. Since the time the first model of the Murphy bed emerged, there had been other variations and designs which have given it a more efficient purpose and a better aesthetic. These included sideways mounted Murphy beds, Murphy bunk beds and other space saving solutions which integrated Murphy beds with built in, drop down tables or office desks, sofas and shelving. You can find special Murphy bed designs which also includes lighting and smart storage systems. Ultimately, there is no limit to the look of murphy beds since it is highly customizable. It can also be incorporated into an existing wall feature in a space, such as panelling and other treatments. In addition, Murphy beds are also available in different materials such as metal, natural solid wood and engineered wood. Custom suppliers also produce these beds in different finishes which include traditional paint and stain finishes and more modern alternatives such as laminates, acrylic and veneers. It can be bought ready made from furniture suppliers or it can also be custom built. The greatest benefit of the Murphy bed is that it frees up floor space, allowing for more room for other furniture. In addition, Murphy beds also provide versatility and flexibility in terms of application as it allows homeowners to convert almost any existing space in the home into an extra sleeping area. It can fit easily into any design, provided that there is enough wall space. A living room, for example, can be easily converted into a sleeping quarters at night from an entertainment area in the morning. Murphy beds are especially useful in residential units where space is at premium like apartments, studios, condominiums, dorm rooms, hotel and mobile homes. Alternatively, Murphy beds can also be used in large homes for creating multi purpose rooms such as offices or craft rooms. 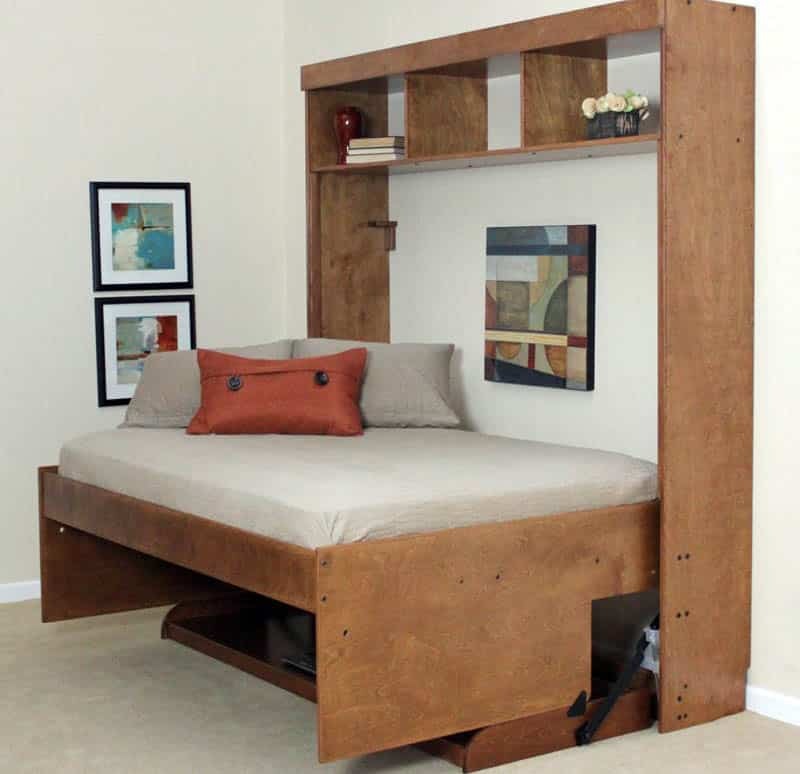 Much like Murphy beds, trundle beds are also another ideal form of space saving bed. Also known as Truckle beds, a trundle bed is a low bed that is stored under a larger, standard height bed. Typically, trundle beds are on rollers or castors and can be rolled in and out easily for use when needed. Essentially, trundle beds can also be called as two twin beds in one because it provides two sleeping spaces in one piece of furniture, but takes up no more space than a regular twin sized bed would occupy, when not in use. Typically, the lower bed requires a thinner and a slightly shorter form of mattress in order for it to fit underneath the upper bed. For some people, this can be a bit uncomfortable to use, especially because it is closer to the ground and has less support than a regular mattress, making it a less ideal option for older adults or people dealing with back problems. However, trundle beds make a good choice for children’s rooms, especially for those who love sleepovers. They are also perfectly suited for teens and overnight guests. As mentioned, the main reason that people usually buy trundle beds is to save space. Trundle beds takes up less floor area, but provides additional storage. Trundle beds are available in different designs which include built in drawers for the bottom bed, allowing you to store pillows, extra beddings or other items. In addition, trundle beds also serve dual purposes because aside from providing an extra sleeping space for guests, the upper bed can also be used as a couch for socializing or a chaise lounge for relaxing, depending on its design. Another major advantage of the trundle bed is that it is accessible and easy to use. You can quickly roll out your second bed when needed because it slides out easily. Just add your beddings and pillows, and your extra sleeping space is ready in no time. When it comes to the materials, trundle beds can be made up of any material that is commonly used to produce a standard sized bed. Material options include solid wood, engineered wood or metal, while some also come upholstered. Choosing the material for your trundle bed will greatly depend on the prevailing style of your home and your personal preference and taste. Typically, trundle beds come in limited sizes since they are designed to fit in in compact spaces. They are mostly available in full and twin sizes. In terms of the size of the mattress, the upper beds can use any thickness of mattress that you prefer, whereas the bottom bed, will need to be thinner at around 8 to 10 inches thick in order for it to fit properly. A good option for trundle bed mattress is memory foam since it gives maximum comfort, is supportive, and also not as thick as a traditional mattress because of the absence of a box spring. There are three popular variations of the trundle bed namely : daybed roll out trundle, day bed roll out pop up trundle and drawer trundles. Daybed roll out trundle – Daybed roll out trundles are the standard type of trundle beds which have low pull out beds at a fixed height. Daybed roll out pop up trundle – Day bed roll out pop up trundles have the same design as daybed roll out trundles, except that they have an added feature which allows the pull out beds to be raised up to the same height as the day bed frame. 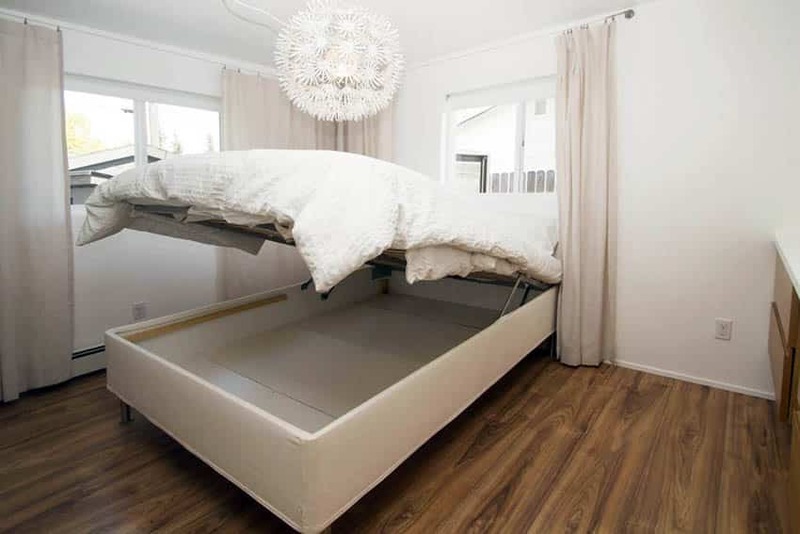 It can be used in lowered or raised positions, as a stand alone bed, or it can also be pushed up against the daybed to create a king size bed. Drawer trundle – Drawer trundles are like daybed roll out trundles but they look like drawers. They slide underneath a standard sized bed, or in some cases a bunk bed, and accommodate a twin size mattress. These trundles do not elevate and have a fixed height. The compact size and space saving ability of bunk beds make them a popular feature not only in residential spaces but also in hospitality institutions. You may have seen them in hostels, dorms, summer camp cabins and children’s bedrooms. By definition, a bunk bed is a type of bed in which two beds are stacked on top of another, using only one bed frame and essentially taking up a space for one furniture. Structural wise, bunk beds are supported by four poles or pillars, each placed at corners of the bed. A ladder is normally used to get to the upper bed. Typically, the upper bed is surrounded by a railing to keep the user from falling. With bunk beds, the mattress does not require a box spring, but instead it lays flat on a “bunkie board”. 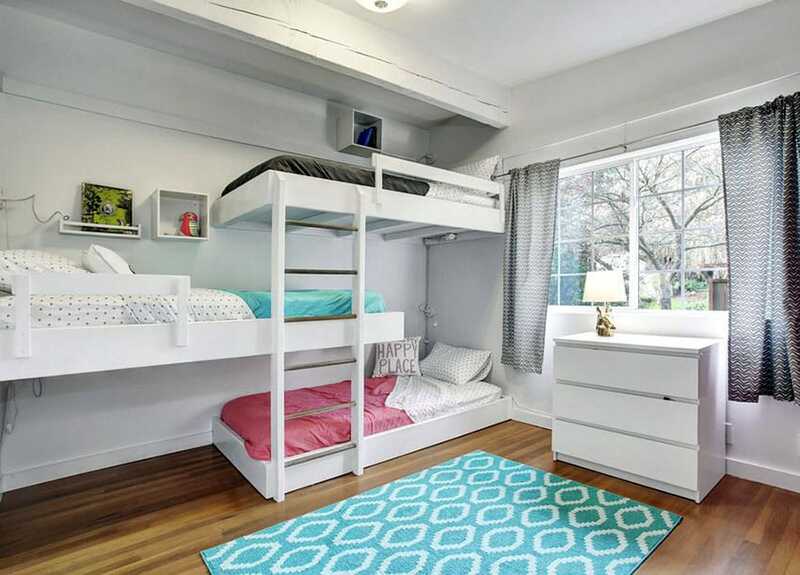 Using bunk beds present three major advantages namely flexibility, savings and space maximization. 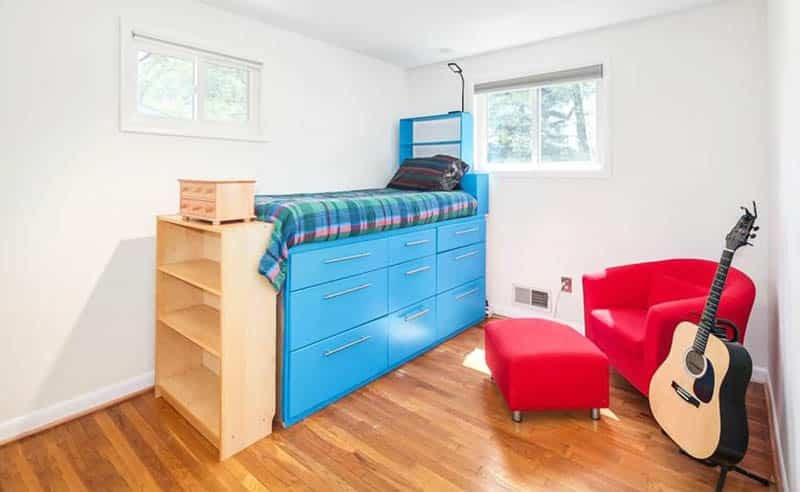 First, bunk bed are ingenious space savers as they allow two or more people to sleep in the same room by taking advantage of vertical space and freeing up valuable floor space for other activities and making way for other pieces of furniture like desks, dressers or cabinets. Second, bunk beds also result to money savings since it eliminates added expenses for headboards, box springs and foundations. Bunk beds can also significantly lower the overall cost of a home because instead of using numerous rooms, you can utilize a single one and fit it with several bunks to accommodate multiple users. Lastly, bunk beds also provide flexibility as it can be easily modified and comes in a variety of design options. As mentioned, some bunk beds can be eventually separated into two twin beds, while others have multiple functions that can serve as sleeping, seating and storage furniture. Bunk beds come in several types, variations and sizes namely standard bunk beds, twin over full bunk beds, full over full bunk beds futon bunks and L shaped bunks. Loft beds are also essentially, a form of bunk bed but instead of accommodating several users, it can only be used by one person. Standard bunk beds – Standard bunk beds are the most common type of bunk beds. It is composed of two same size mattresses that are stacked directly over one another. Most standard bunks have twin sized mattresses for the top and bottom beds and can comfortably accommodate two persons. Twin over full bunk bed – A twin over full bunk bed is arranged the same way as a standard bunk bed, except that the bottom mattress is in full size while the upper mattress is a twin size. This type of bunk bed can comfortably accommodate three persons – one person on the top bed and two persons at the bottom. Full over full bunk bed – Also referred to as the “wider bed”, a full over full bunk bed has a wider size of top and bottom bed, which is typically in double size. This type of bunk bed can comfortably accommodate four persons at the same time – two persons each for the top and bottom beds. Futon bunk – A futon bunk is also arranged like a standard bunk except that the lower bunk is a Western style “futon couch” or sofa bed. Instead of using a standard mattress, the lower unit converts from a couch to a bed, or vice versa, as needed. Futon bunks are typically used in small apartments because it is multi purpose and combines both a seating and sleeping furniture into one piece. L shaped bunk beds – The L shaped bunk bed, as it name suggests, has an L shaped form when viewed from above. The bottom bed is oriented at a right angle to the top bed. The extra area directly below the top bed and beside the bottom bed forms a small alcove where a desk or bookshelf can be placed. Bunk beds with desks and storage – Some bunk beds incorporated built in storage units, shelves and desks at both ends of the bed, thus eliminating the need for separate furniture and storage systems. Bunk beds also come in different design which typically integrate built in storage systems, closets and desks. This ensures that no additional furniture takes up extra space, while also providing ease in terms of work flow and access within the space. In some cases, the bottom beds are furnished with a small curtain to allow for privacy. There are also several bunk bed models which the top and bottom beds can be separated and used as individual freestanding regular beds. Contrary to popular belief that bunk beds are only suite for kids, these can also be used creatively by adults in apartments, dorms and small rooms. The materials used for bunk beds are diverse and with such, its price also varies widely too. Economy models of bunk beds are usually made up of metal, softwood or solid plastic frames, while the mattresses are supported by a metal wire and spring suspension. More expensive models, on the other hand, are typically made with solid hardwoods and are furnished with built in shelves, drawers, hanging racks, desks and other accessories. Custom made options allow for more room in terms of design as the bunk bed is tailor made according to one’s space requirements, design and specifications. In some cases, homeowners also make DIY bunk beds using wooden planks and fasteners. Loft beds are a variation of bunk beds, but instead of having a bottom bunk, the space beneath the top bunk is usually open and creates an area for other furniture such as chest of drawers, dresser, study tables, a closet or even a work area. In summary, it is a single bed, elevated in supports, without a lower bunk. Loft beds are also sometimes referred to as mezzanine beds, high sleeper beds or loft bunks. There are several popular variations of the loft bed namely low lofts, mid lofts, high lofts and corner lofts, and triple loft beds. These types vary depending on the height and configuration of the bed. Low loft – Low loft beds are specifically designed for elementary school aged kids and have a height that is lower than a standard loft bed. Mid loft – Mid lofts are slightly higher than low lofts and allows for the addition of plenty of storage underneath. High loft – Also known as an ultra loft, high loft beds have a height of 50 inches (for 8 feet ceilings), 55 1/2 inches (for 9 feet ceilings) and 63 inches (for 10 feet ceilings), which leaves plenty of space to add a desk, study table or additional storage under the bed. Corner loft – Corner lofts are characterized by two beds across a corner from each, other. 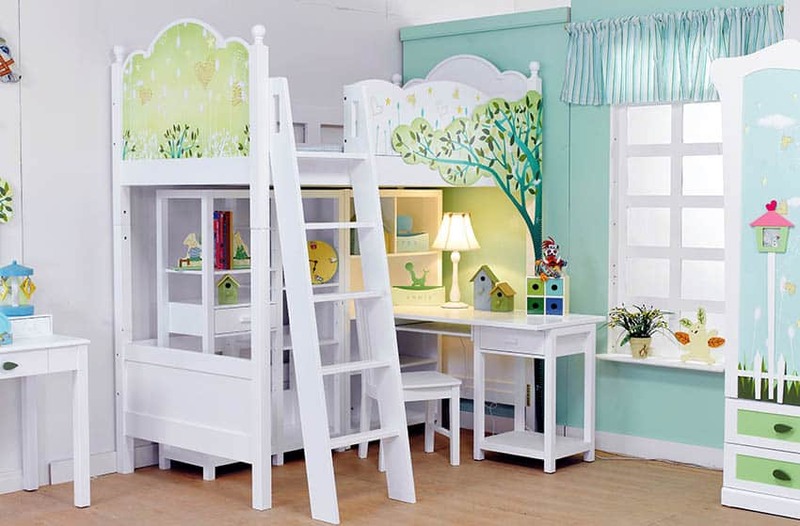 This is ideal for two kids sharing a room. 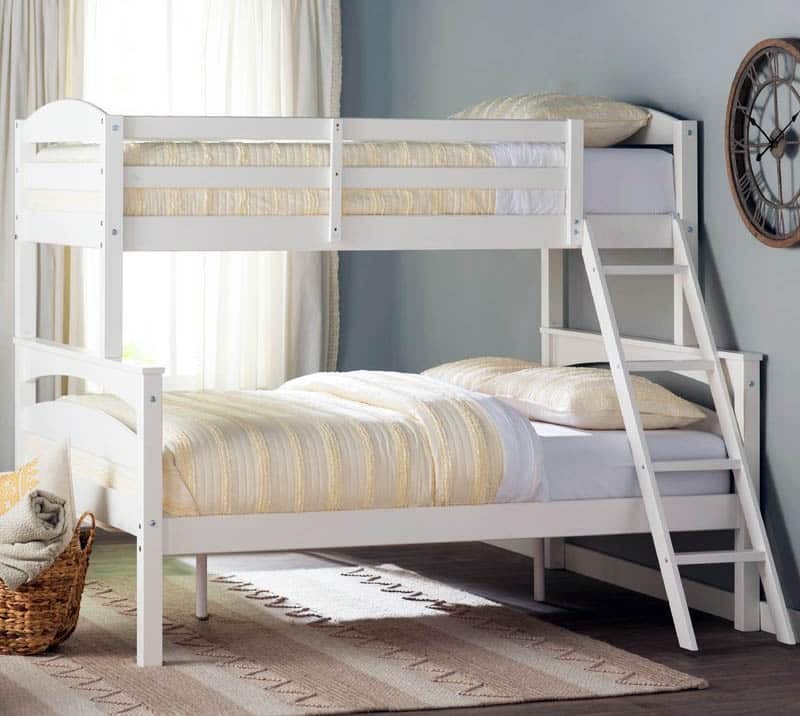 Triple loft bed or corner lofts – Triple loft beds have three bunks instead of two. 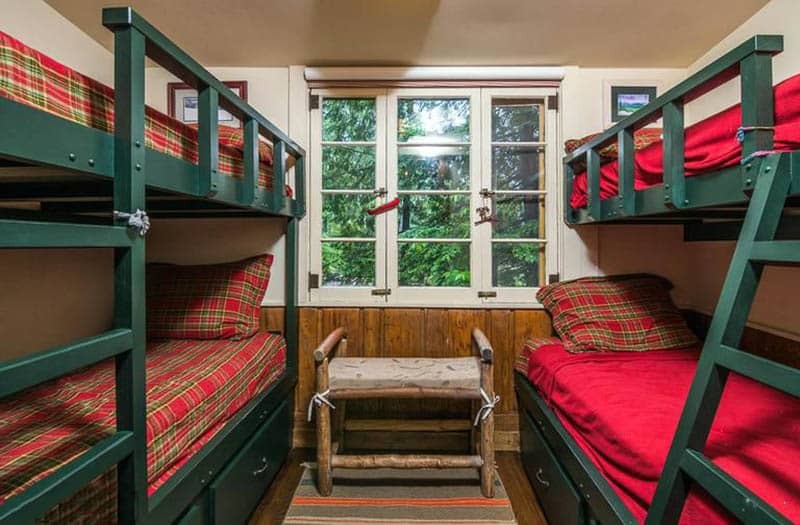 These bunks are a combination of bed types. It can be a loft bed perpendicularly attached to a bunk bed, forming an L shaped top bunk, which can accommodate two users simultaneously. In some cases it is made up of three layers of bunk beds at the same orientation or the middle bunk can be oriented vertically rather than horizontally. 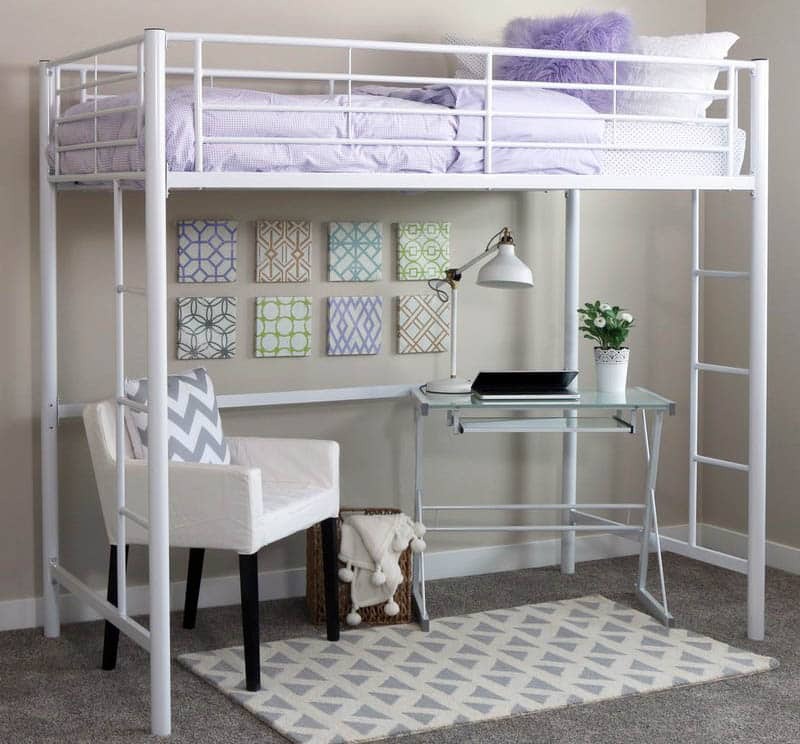 The most common design of a loft bed usually incorporates a workstation underneath which can be used for both studying and working. This typically includes a desk for a computer, storage units for school supplies or other items and bookshelves. In some cases, the bottom space of a loft bed is furnished with a vanity mirror and a dresser. The endless possibilities in designing a loft bed are actually endless and will depend on one’s taste and needs. The versatility of loft beds make them appropriate not only for kids, but also for adults living in residential units with limited space. Loft beds take advantage of vertical space while freeing up floor space and using an area that would otherwise be left unused. Introducing varying levels to your design will allow you to make the most of your valuable space, providing for a study space, some additional storage, a spacious social area or a relaxation spot with a futon. The added storage helps you create a more clutter less room. In addition, lofting also allows for more flexibility in terms of layout. A lofted bed presents more options in arranging a room, as opposed to a traditional bed set up. Your bedroom can now serve multiple purposes such as a home office, a hobby room or a walk in closet. Loft beds are also ideal for shared spaces, whether in a dorm room or in a house, because instead of using two separate spaces, you can all fit the essentials into one, while still having enough floor space for other use. In terms of cost, loft beds can be more expensive than bunk beds due to the added built in storage units and features. Generally, the more features you incorporate into your loft bed, the higher its cost will be. Sofa beds are convenient, practical and easy space saving fixes which help transform any space into a sleeping area. Sometimes referred to as a “sleeper sofa”,”hide a bed”, “bed couch”, “half beds” or “chair beds”, a sofa bed is a form of couch which transforms into a bed. Typically, a metal frame and thin is hidden underneath its cushion which stretches out into a bed and can be folded back into a seating furniture using a simple mechanism. Sofa beds come in different sizes but majority of which are available with three seater capacities. For small spaces, twin size sofa beds are the best option since they are typically less than 5 feet wide and can comfortably accommodate a single sleeping person. The size of the mattress for a twin size sleeper sofa is about 39 inches wide. When opened up, a twin size sofa bed can stretch anywhere from 54 inches to 85 inches long. Full size sofa beds, on the other hand, are designed to accommodate two sleeping persons and are typically about 72 inches wide and approximately 90 inches in length when fully opened. These sofa beds typically have a size that is between a three seater sofa and a love seat, when folded. Common sizes of sofa beds are 60 inches x 72 inches, 58 inches x 72 inches, 54 inches x 72 inches and 52 inches x 72 inches. The average thickness for the mattress is around 4.5 inches. All of these types make good choices for small residential spaces, studio flats and tiny apartments. Full sized sofa beds are the ideal choice if you are planning to use your sleeper every night for sleeping. This is mainly because twin sized sofa beds can sometimes feel too small and restricting, but a full sized sofa bed gives more comfort and more room to stretch out. However, if two persons are planning to use a sleeper as a permanent sleeping space a night, a full sized sofa bed may not be able to provide maximum comfort, despite being designed to fit two individuals. There are also several ways by which a sofa bed operates. Some simply have chair backs which fold down to create a bed for two, other designs have a fully hidden thin mattress supported by metal frames which can be folded and hidden underneath the cushions. Aside from the size and mechanism, sofa beds can also be classified into different types namely, standard sofa beds, clic clac sofa beds, futon sofa, fold out sofa, drop end sofa beds, A frame sofa beds, pull out sleeper sofas. Standard foam sofa beds – Standard sofa beds are the simplest type of sleepers which are typically small and designed for occasional use. These are usually made up of foam and upholstery, and have no framing material. Clic clac sofa beds – A clic clac sofa bed is a type of convertible sofa bed, in which the backrest of the sofa drops and aligns with the seat cushion to form a double sized bed. It is more durable than a standard foam sofa bed and is best for everyday use. Futon sofa – Futon sofas and clic clac sofa beds are very much alike. But in terms of design, a futon sofa bed has visible wooden or tubular steel frames. Futon sofas are commonly used in small apartments. Fold out sofa – A fold out sofa, as it name suggests, are two or three seater sofas which fold out to form a double or queen size bed. The mattress for a fold out sofa is typically folded into two or three and hidden underneath the seat cushions of the sofa. When extended, it is supported by visible metal legs. While, the back rest remains fixed and acts sort of like a headboard for the bed. Fold out sofas are easy to use and are also very common in the market. Drop end sofa beds – Drop end sofa beds are characterized by being flexible and are convertible to either a single bed or double bed. The sofa converts to a bed by dropping the armrests on both ends, creating a longer surface for sleeping. A frame sofa beds – Unlike fold out sofas wherein the backrest remains to be fixed, the backrest for A frame sofa beds are movable and drops to form a longer sleeping surface.The rest of the mattress is also hidden underneath the seat cushion and extends to a whole bed by folding out. A frame sofa beds are designed to accommodate your entire back down. Pull out sleeper sofas – Pull out sleeper sofas, as their name suggests, convert into a bed by simply pulling out or rolling out a piece of mattress or foam that is hidden underneath the seats. Unlike the other types of sofa beds, its mattress is not folded and it operates kind of similarly to a trundle bed. Its cushions are covered with heavy poly foam made with polyester fiber. The main advantage of sofa beds is that it helps overcome space limitations. Since it serves multiple purposes, a sofa bed eliminates the need to purchase separating seating and sleeping furniture. A simple sofa by day can instantly turn into a cozy bed at night. As result, it also saves you money in the process. It is practical and cost effective furniture for your home, that provides luxury, comfort, convenience and relaxation. In addition, a sofa bed also helps transform spaces easily into an extra bedroom or sleeping area. A sofa bed can quickly convert your living room into a guest room with minimal effort. It comes in handy for people who regularly welcome guests into their homes. A sofa bed also provides maximum comfort and is ideal for lazy weekends, for hanging outs or for personal relaxation. Also, if you need extra seating, you can also lay it out as a bed and use it to accommodate more sitting people – it doubles your sofa’s capacity in an instant. While functionality is a very important aspect of your decision making process, it is important to keep in mind several factors when choosing the best sofa bed for your small space. As with any type of space and piece of furniture, the first and foremost step is to consider your needs. How do you plan on using your sofa bed? Will it be used as a primary sleeping space or an occasional extra bed for guests? If planning to use your sleeper sofa on a day to day basis, carefully look into the types of mattresses that comes with it, whether it may be special mattresses, spring mattresses or air beds. Consider trying on your sofa bed before purchasing so that you can get a general feel of the furniture material. Next, is to choose a material that suits your personal style and specific needs. Look for fabrics which do not catch dirt easily and consider a frame that is sturdily built. Loose cushions are also a good choice since the sofa bed covers can be removed and cleaned in a washer. Also, look for a mechanism that opens and closes easily. There are many manufacturers and furniture suppliers which offer sofa beds, thus there are great differences in terms of both quality and pricing. Often sleepers in higher price points are better made since they use fine materials. Needless to say, it is always ideal to buy the best sofa bed that you can afford. You may have seen folding beds in several hotels as this is often served when you request for an added mattress for an extra person. A folding bed is a simple type of single or twin sized bed that can be folded into two or three sections for storage. 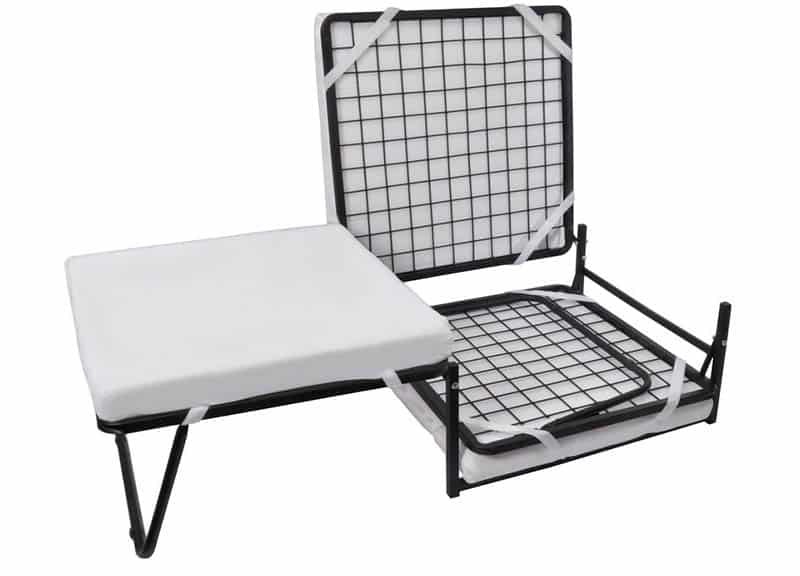 It is supported by a reinforced metal frame and springs and typically has a 4 to 5 inches mattress. Folding beds feature fully automatic folding legs which open independently in seconds allowing you to set up bed with ease and stow it away in a compact size when not in use. In some cases, folding beds also feature wheels or castors, which allow for mobility and ease of transportation between different areas in the home. There are many types of folding beds and all of them deliver great benefits. Folding beds offer the full practicality of the sofa bed, but takes up less amount of the space. It is the perfect piece of furniture for unexpected guest and visitors. The comfort, convenience and compact design of a folding bed makes it an ideal space saving bed for homes wherein space is at a premium like apartments, condominiums, studios and flats. Folding beds are ideal specifically if you need an extra sleeping space that is going be used infrequently. When not in ise, you can easily stow folding beds away in a corner, a storage closet, at the back of a door, under a bed, garage or even in an existing room in your house. It doesn’t take up much space, so it won’t be an obstruction to the area and the work flow or traffic of the space. It allows you to convert any existing part of the house into a guest room in just seconds. Folding beds are also practical for people who live in mobile homes, as these beds are totally compact and portable. They are also very affordable and comes is lots of designs and often sturdy materials which can last for years. Some folding feds are also made up of memory foam mattresses, which provide maximum comfort and pleasure during relaxation. In addition, they come in all sizes, making them an ideal solution for both adults and children. If you are looking for a bed that also provides seating when you’re not sleeping, opt for a daybed. A day bed is a cross between a chaise longue, couch and a bed. 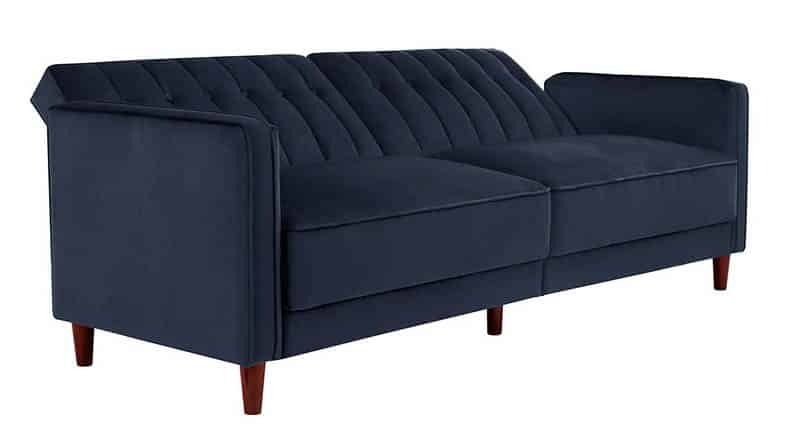 It has a three sided headboard that resembles the arms and backrest of a sofa. It also makes use of a standard mattress. Unlike sofa beds which are convertible furniture and usually employ mechanisms in order to transform from one purpose to another, a daybed is essentially a sleeping and seating furniture combined into one. A daybed typically comes in twin size which can accommodate one sleeping person or double size which can accommodate one or two sleeping persons. The standard sizes for day beds are 39 inches x 75 inches or 99 centimeters × 191 centimeters. A daybed differs from a sofa in terms of depth. The average sofa has a seat depth of 18 to 22 inches, while a daybed is typically 39 inches, which is almost double. And since it has extra room, pillows are typically used to fill the back and surround the sides of a daybed. 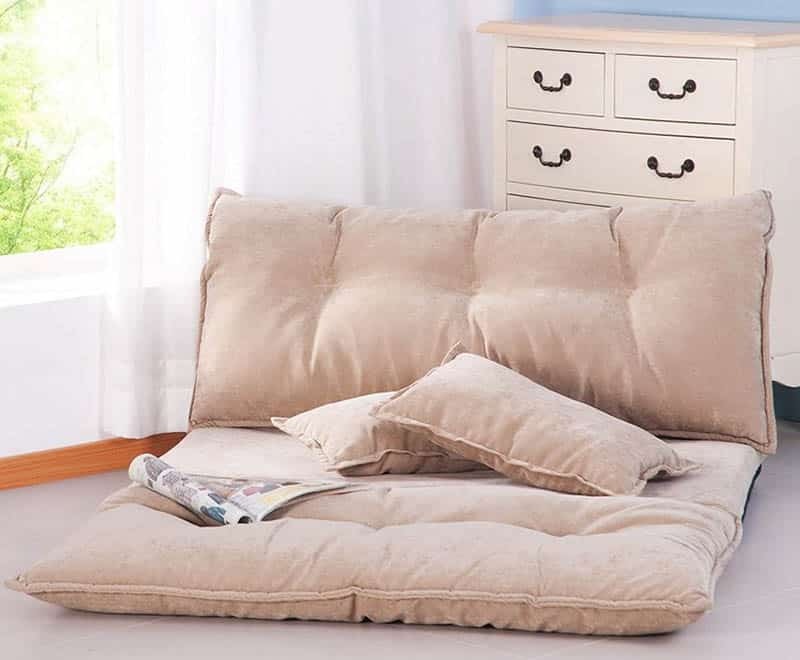 This helps reduce the daybed depth while also providing a comfortable backrest when seating. In terms of materials, a daybed is commonly made up of a metal frame, wood frame or a combination of both. It can hold a standard size spring mattress and does not require a thinner foam, thus providing more comfort and support compared to a sofa bed or futon sofa. There are also several variations of daybeds that feature a trundle to expand sleeping capacity. In some cases, manufacturers include a built in under the bed storage unit, which is ideal for keeping pillows, unused beddings, toys and other belongings. Additionally, daybeds do not only make a good spare bed but they also work well for sitting, lounging and reclining. This is especially advantageous for small homes, compact bedrooms, studios and apartments because it eliminates the need to purchase two separate furniture for seating and sleeping. If you do not have a space for a chair, sofa or loveseat in your room, you can opt for a daybed instead of a regular bed. A daybed also offers ease in terms of performing different tasks. 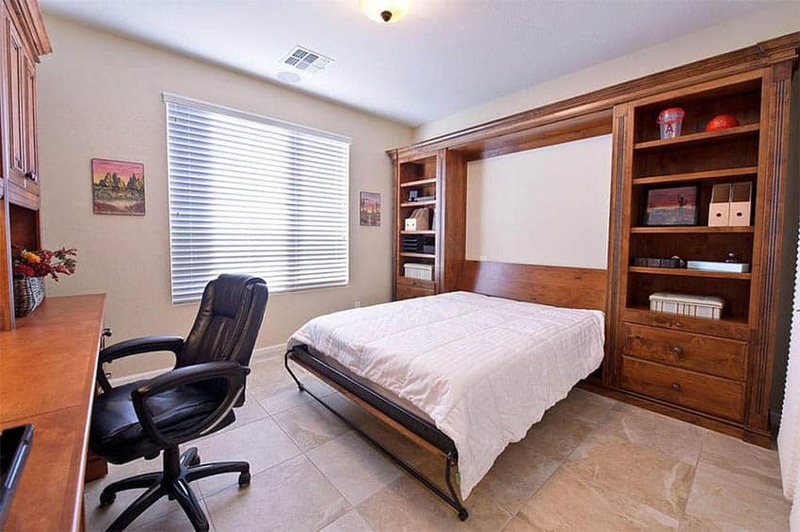 With a regular twin sized bed, you must recline or lean against a small headboard to lounge, use a laptop, read a book, play video games, study or operate electronic devices, whereas with daybeds, you get the same ease that a chaise provides, allowing you to easily sit up, recline and get off the bed. Divan beds have been around for decades, and innovations in its design make it an ideal space saving solution for small homes. In general, a divan bed is a bed with a thick base which traditionally did not have a headboard. It is composed of two parts, a bed box which is constructed with a wooden frame and upholstered with fabric. The bed box acts as a base for a mattress which sits on top of it. As mentioned, divan beds do not always have headboards but they can be furnished with a padded board or upholstered panel that is mounted to the wall at the head of the bed. Most divan bases have castors which allow for easy maneuvering. While those that have bases thicker than 3 feet are usually split in half which enables easy access. Nowadays, divan beds typically feature integrated storage in the bed base or bed box. The most popular type of divan beds with storage has drawers that slide out of the base. Variations in design range from one to six pieces of drawers, depending on the size of the bed. These drawers may slide from the side, at the center of the base or outward from the end of the base. The sizes for divan beds are similar to any standard sized bed and ranges from single, twin, full, double, queen and king sizes. Although it does not really save that much of space in terms of the furniture size, it increases room for storage and eliminates the need for added closets or dresses which may take up precious floor space in a room. Divan beds with drawers also help reduce clutter, consequently making your room feel more airy and spacious. Divan beds with drawers are also an easier alternative to under mattress storage solutions. There is no strain of lifting a mattress, but rather, storage can be easily accessed by just sliding the compartments in and out of the bed box. These drawers can also be used for stowing away books, personal items, extra beddings, pillows or even futons. While the absence of a headboard can be a disadvantage for some, divan beds with drawers can also double as a long, low seating furniture, especially if it is furnished with a comfy fabric and soft cushions. Design wise, divan beds with storage can help soften the look of an interior, while also bringing variation in texture since it is upholstered all the way around. 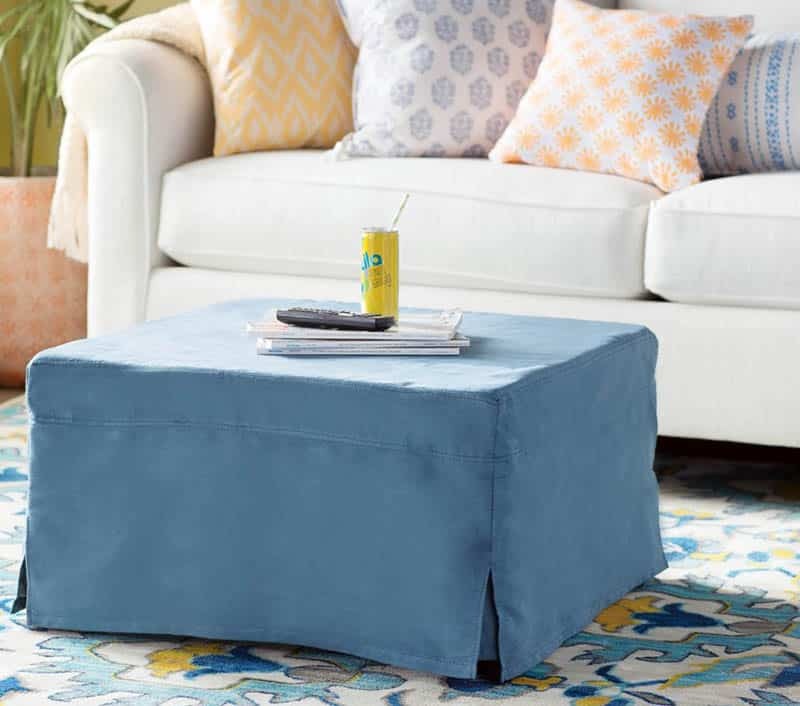 By definition an ottoman is a piece of furniture that looks like a large box with a soft top. It is commonly used as an armless, backless seat, a foot stool or a storage. But in terms of bed design, an ottoman bed are basically big, upholstered bed boxes that feature a storage underneath the mattress. Ottoman beds are accessed by tilting the mattress, revealing a massive storage space within the base of the bed, as opposed to a divan bed which makes use of draw storage systems. Think of it as a giant chest storage for your room. There are two designs of ottoman storage bed – one that tilts sideways and one that tilts from the bottom towards the headboard. Although the base of the bed is hollow, an ottoman bed does not compromise comfort since it usually features a slatted base with full springs that supports your body. When the mattress is lifted, this slatted base is lifted too, providing maximum access. Ottoman beds provide more storage compared to divan beds because the whole space underneath the mattress can be utilized. Ottoman beds are ideal for storing bulky items such as spare beddings, extra duvets, winter blankets, pillows or seasonal clothing like heavy jackets, trench coats. Alternatively, it can be used for stowing away small items like books, children’s toys, unused clothes, towels and linen. The benefits that ottoman beds offer are similar to what a divan bed provides. Although they have the same size as a standard bed, they help maximize space by serving dual purposes. 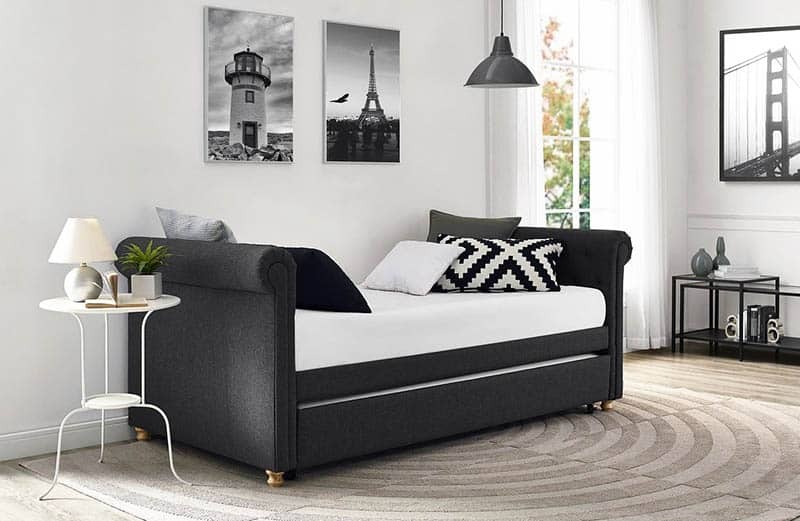 Aside from providing maximum storage space, an ottoman storage bed also provides ease of access and convenience – you simply lift the lid on which the mattress sits whenever you need to get something. It helps lessen clutter, making a room feel more spacious and airy. As people become more and more geared toward smart design solutions, the conventional design of the bed also continues to evolve. Nowadays, designers and manufactures have produce modern transforming beds which are fully integrated into an interior. The idea of transforming beds originally started from Murphy beds. This basic technology has been an inspiration for most designers which improved it over time, combining more uses into one furniture system. Typically these transforming beds are built into walls and incorporated to structures to create a seamless look for the home and to meet the minimalist aesthetic of modern spaces. Compared to other space saving beds, transforming beds are much more expensive mainly because they are custom made according to one’s specific design requirements and specifications. This is highly advantageous especially in terms of aesthetics because homeowners get to choose the exact material, finish, texture and hardware that meets their personal taste and style. There is no type of space saving bed that does not work for adults, whether you are a bachelor living in a studio unit, a college student living in a dorm space, a couple renting out an apartment, a freelancer who wants to have a relaxing spot in the home office, or simply someone who wants to have an extra guest room at home. A living room bedroom combo can be accomplished in minutes with the right type of bed. All of these space saving beds can be used to furnish small rooms and residences. However when choosing the best space saving bed for adults, it is important to consider several factors such as their needs, the age group that they belong in and the type of space that the bed will be used for. We mentioned the age group to be an important deciding factor due to safety and the capacity of the person. Elderly people, for example, may find it hard to climb up a loft or bed bed, as compared to adults in their early 20’s or 30’s. The needs of a person also matters because it helps determine what else is required, aside from a sleeping space. Do you need storage for your clothes? A desk for working or studying? Or perhaps a seating area? Your daily activities also play a big part as they help set the bar for your room’s overall function. For middle aged adults who live in flats and apartments, the best option for space saving beds are loft beds. Loft beds meet maximum functionality, full accessibility and optimum space efficiency. Loft beds bank a big chunk of your furniture into one area, allowing for more space in the room. They’re specifically helpful for adults who need a sleeping space, seating area, storage and home office all in one area. They help in terms of ensuring a better workflow in a room, because everything is within reach – after using your computer, all you need to do is climb up the ladder to sleep. Among the types of beds mentioned above, the best space saving beds that work for small rooms are bunk beds and loft beds, since they help free up floor space by taking advantage of vertical space. Ceiling heights are usually left unutilized in rooms, but with the help of elevated beds, every inch of the room is maximized, not only the floor area. To optimize the function of a bunk bed, makes sure to include storage systems as it also helps eliminate the need for added freestanding furniture pieces. Sofa beds are also ideal for use in small rooms since they serve multiple purposes and provide both a seating and sleeping furniture into one. In addition, sofa beds can also accommodate more sleeping persons. Murphy beds are also innovative options for small rooms because they easily tuck into a wall when not in use, freeing up space in the process and providing more room for other activities. Measure your space accurately. Measure your bedroom before selecting a bed and leave some room for walking around the bed. From this you can determine what size of bed works best for your home, whether it may be twin, full or double. Also if opting to go with a Murphy bed, check if there is enough floor space to lay the bed down, taking into account clearances. The same goes for sofa beds, check if there is enough area to accommodate a fully extended sleeper. Conceal your bed behind creatively designed doors. Instead of going with a conventional plain wall, try adding visual interest to your Murphy beds by using it as an accent wall for the space. Feature classic wall panels, add wallpaper or hide it behind doors to make them seem like they are part of a storage cabinet. Go for beds which can accommodate more users. You’ll never know when you are going to need an extra sleeping space around the home. And since there are so many options that can be explored, why not choose a bed that can give you maximum sleeping capacity. Sofa beds, for example, are typically as long as three seater sofas but can accommodate two users. Murphy beds are for twin beds too. For some homeowners, twin bed can be quite more challenging than double beds, because they have to sit separately and occupy more space in a typical room setup. For this reason, fold down beds or Murphy beds are more space efficient options because they can hide the beds when not in use. 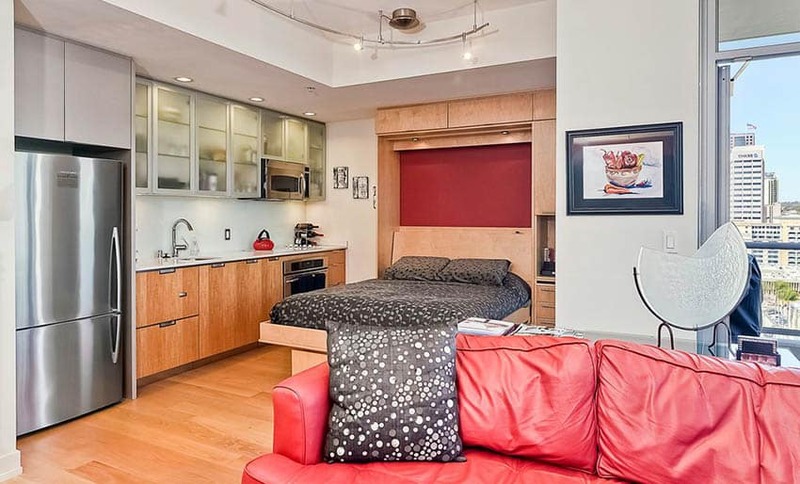 If you have a long wall to spare, you can set up two twin Murphy beds at a regular interval. Convert your home office into a guest room. When you are working in a home office, there are certain instances when you get tired and feel the need to relax. Or in some cases, you have visitors but don’t have a guest room at home. A space saving bed is perfect for those moments because it provides a temporary relaxing space or an occasional guest sleeping quarters. You can easily convert your home office into a guest room by including a Murphy bed, fold down bed or sofa bed into your layout. 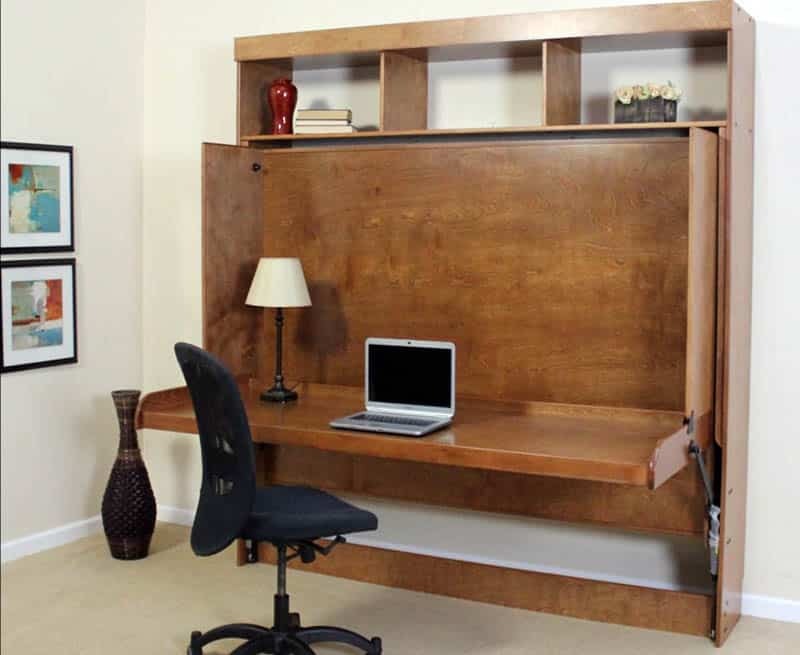 This does not only work for home offices, but also for other neglected spaces in the house. A basement, for example, has great potential as it can basically transform into anything. You can turn it into a guest room, a media room or game room with a sleeping space. To help maintain flexibility, a space saving bed such as a sofa bed, murphy bed or transforming bed may be used. Opt for custom made designs. The beauty of having custom made space saving beds is that they are tailored according to one’s specific needs, space requirements and preference in style. Custom made bed designs can also be creative and very original. You can request custom bed makers for shelves and drawers for added storage or a desk where you can work or study. You can also choose decorative finishes and materials that perfectly match your room’s design and color scheme add visual interest to your home’s interiors. Visit this page to see more bedroom layout ideas to help plan your next design.